Ricky Miller in action for Posh at Oldham. 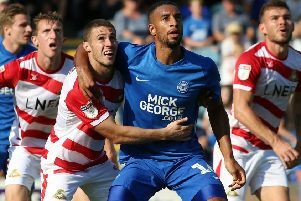 Peterborough United manager Grant McCann has been assured there is no ‘referee vendetta’ against striker Ricky Miller. McCann has spoken to the head of Football League referees about decisions that have gone against his team, notably two recent penalty claims that went against Miller in games against Oldham and Northampton. He was cautioned for alleged simulation in the Cobblers contest, his second such caution of the season. Posh star Marcus Maddison has shrugged off a niggly injury. “We’ve been hard done by with refereeing decisions this season,” McCann insisted. “Which is why I put a call in to the referees’ chief this week. “We received an apology for the goal that was wrongly chalked off at Walsall which cost us two points, but I was also concerned there might be a vendetta against Ricky. I can’t have my centre forward having a reputation as a diver because he isn’t. “He should have won us a penalty at Oldham when he was clearly tripped and it was also a penalty against Northampton when he was actually cautioned for diving. I had to take him off in that game for fear of him getting sent off, partly because of a bad decision. Miller is set to start tomorrow’s League One match against struggling Gillingham at the ABAX Stadium (October 14, 3pm). Attacking midfielder Gwion Edwards is set to return after missing the last three games because of a groin injury. Fellow midfielder Callum Chettle is also available after a lenghty absence with a hamstring injury. McCann reckons his side are raring to go after a rare weekend off. Putting on a show for the Posh fans after the 4-1 capitulation against Oxford in the previous home match is a priority. “It was like the first day of pre-season again when the players came back,” McCann added. “Their attitude was spot on and they’ve looked sharp, fresh and in good form. “It’s important to get rest into the players at various times. They’ve only had seven or eight days off since the season started so the break came at a good time for us. “It’s also enabled us to get the injured players back on their feet. Gwion is fine and Marcus Maddison has also shrugged off a knock that affected his last two performances. “It’s important to keep those two players fit as they are among the best two wide players in the division. We certainly can’t afford for them to miss the same game which is why Marcus played through his problem. “We are going into the game tomorrow with our eyes wide open. Gillingham have not had a good time of it, but I expect to be committed and tough opponents.